Home » Solutions » What Affect The Measurement accuracy of Oxygen Gas Detector? The electrochemical sensor it adopts reacts sensitively, which is suitable for continuous detection of oxygen percentage concentration in ambient air of industrial and mining enterprises. When the ambient concentration is high, alarm of high and low limit sound, light and vibration should be made, so as to inform workers on site to evacuate dangerous areas as soon as possible. Microanalysis requires that environmental damage of oxygen caused by dead corners of pipe fittings, chamfer valves and watch heads in the air circuit shall be effectively eliminated. Therefore, a swg should be used to simply the pneumatic switch as much as possible, and connections with small dead corners shall be selected. In winter, water seal, oil seal, wax seal and other equipment shall not be used, in case the dissolved oxygen escapes to damage environment or avoid adding purification equipment which is easy to cause environmental damage to the pipeline between the oxygen lead-out and the inlet of oxygen analyzer. Only in this way can the switch keep clean and obtain accurate data. When re-using the oxygen detector, first of all, you should notice whether air leaks into the connection of the sampling pipeline, please blow out the leaked air seriously and avoid massive oxygen to pass through the sensor, so as to extend the sensor's service life. In the purification process of pipeline switcher, some methods should be taken to shorten the purification time. The riveting machine generally uses high-pressure ventilation and small-flow blowing alternately to quickly purify pipelines. Pipeline material and surface roughness will also affect the change of oxygen content in oxygen. Generally, plastic pipe and rubber pipe are not suitable for connection pipes. Copper or stainless steel pipes are usually used. For ultramicro analysis (<0, 1ppm), polished stainless steel pipes shall be adopted. Leakage detection of oxygen detector must be strictly carried out before its initial operation. 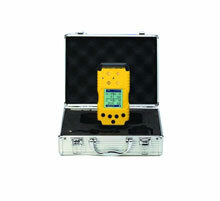 The oxygen analyzer can get correct data only under tight condition. Any leakage at the connections, welding points or valves would lead to the reverse osmosis of oxygen in the air into the pipeline and the oxygen analyzer, thus obtaining the result of higher oxygen content.